Home > 2017 > 01/06 > Behind the Numbers: How is each Jet performing at even strength? Behind the Numbers: How is each Jet performing at even strength? At the thirty-three game mark we looked at each of the Winnipeg Jets player’s performance with expected goal production. Now at the half-way point, let’s take a look at a more overall number looking at players and their performance at even strength. Expected plus-minus (XPM) does not bare similarities to the plus-minus stat you would find on NHL.com. Essentially XPM is a expected goal differential adjusted for multiple of variables. We covered expected goals previously, but the short version would be that they are a shot stat where shots are adjusted for a multitude of shot quality factors. Now XPM takes the previous model a few steps further. Firstly, XPM attempts to adjust for the outside factors that influence results. These factors include: linemates on the ice, opponents on the ice, coaches for both teams, zones shift started in, the score in the game, schedule (back-to-backs), and home-ice advantage. 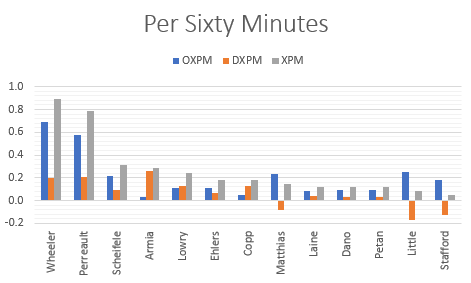 Just like expected goals does not assume to capture all the variables that go into shot quality, XPM does not pretend to capture all the outside variables that could impact a player’s performance. It does, however, bring us one step closer to understanding a player’s true impact on the game. Another factor is that XPM uses past player performance as a prior. As DTM quotes Alex Schuman, a prior is a mathematical way to say “If you’re not sure who should get credit for this, it’s probably the guy who we already think is better.” Basically, the model takes last year into account at the start and then adjusts as the season goes on. This has some drawbacks (two we will touch on later), but it greatly increases the statistic’s predictive prowess. The final major difference is that XPM is zero’d at what replacement level player performance. So having a zero in XPM would suggest a player does not improve a team’s goal expected goal differential by any more or less than an easily attainable replacement level player. There is a lot more to the model, so for a deeper look, check out the original article here. I will add one more note that XPM is not a WAR model, just like Corsi or Expected Goals are not. It ignores things like goal and assist production, individual shot production, etc. However, XPM is a major input into DTM’s WAR. For example, XPM accounts for 57% of a forward’s offensive WAR rating for even-strength and 54% of a defender’s, while accounting for 100% of their defensive ratings in both cases. I really like models like these because you really start to see what makes a player great. We can distinctly separate offense, defense, and overall performance. Wheeler has been an exceptional player. He was a top 10 performer in XPM last year and actually leads the league this season. Perreault had a tough start to the season, but XPM only moves the needle so far due to his solid performance in previous seasons. This is an advantage to XPM, since we are trying to predict future performance rather than describe current performance. Perreault has been much more like his former self since returning from injury, so that can be an advantage to XPM. The fact that Little has already passed Stafford’s impact with three-quarters the ice time is pretty telling of Stafford. You will note that there is not much difference between the Jets young players. This is a slight drawback with XPM, since it relies on past performance to a degree. These players are starting to shape up but it will take time. 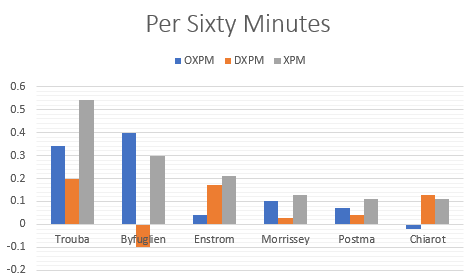 As an example, currently Patrik Laine’s XPM is almost identical to the three rookies in Toronto, despite the fact that all three will likely cary some large differences by season’s end. The previous graph shows total impact. This does not account for differences of icetime, which will artificially stretch the top and bottom players, since the best players tend to play the most. 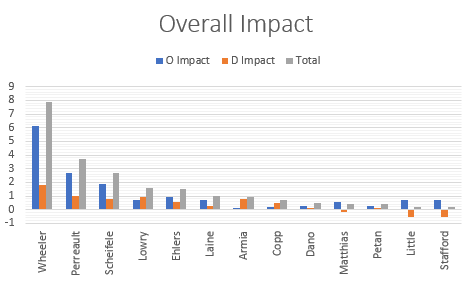 Not many differences here other than Joel Armia rockets up due to his defensive performance. The model seems to view him as the driver on the Joel Armia – Adam Lowry – Shawn Matthias line. I’m a bit surprised on the Bryan Little rating. It is essentially painting him in a similar light as Drew Stafford. Now, there are things Little does well, like scoring, that will show up more in BPM (the other variables in WAR I eluded to earlier) but still it is something to keep an eye on. It is possible that Little is just being unfairly penalized for consistently playing with the Jets best, Wheeler and Ladd/Perreault. However, I honestly think his XPMs will be one that will change dramatically throughout the season. Despite the issues with Little, otherwise the statistic seems to do a fairly good job relative to what I would expect going in. I sometimes hear that “stats don’t measure Dustin Byfuglien’s defensive lapses” but the evidence seems to suggest otherwise. Byfuglien literally has the worst defensive impact on the team, but his offensive impact is so large that he still comes out on top overall. On the other hand, we also see here why Tobias Enstrom is so good despite not providing much offense. Morrissey has done well as a rookie, although I’m not sure how much he has budged from the model’s starting point. You may be surprised by Chiarot’s results, but I’m not… despite also believing Chiarot being way worse than this model is suggesting. I’ll explain a bit more below. Jacob Trouba is good at hockey and I hope he stays a Jet forever. Accounting for ice time and Chiarot falls to the bottom, although he’s still looking relatively terrible by the eye-test and descriptive numbers (like Corsi, scoring chances, and expected goals) the past two seasons. Why? It seems that the cause is the model’s propensity for using priors. Far more often than not, this habit improves the model… but fails it this time. Ben Chiarot was called up as a rookie to the Jets in 2014-15. Once called up, he predominately played with Dustin Byfuglien, who was playing some of the best hockey of his career. The model rarely saw Chiarot away from Byfuglien. When it saw Byfuglien away from Chiarot, it was mostly with Byfuglien playing forward, where Buff has a significantly worse impact on shot and goal differentials. The model does not have an ability to realize it was not a change in position that caused Byfuglien’s improvement, so it assumes the other primary change: Chiarot. Chiarot’s rookie season has the defender posting an XPM in the Byfuglien/Enstrom ranges. His next season he dropped significantly to more around where Morrissey currently stands. By the end of this season, I expect his XPM to be comparable to Mark Stuart (not shown, but below replacement). I think the Chiarot situation is a prime example of why hockey teams need analysts who have strong knowledge base in both statistical analysis and hockey. With understanding both the players and the model, we can see how useful it is, while also being able to correct where it goes wrong. Chiarot is an extreme example of how the model can be wrong, but we also see that it is correcting itself… although taking 3 seasons to do so. The Winnipeg Jets have legitimate strong performers on the team. 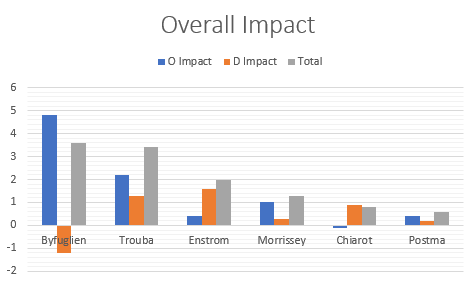 On its back end it has three top-tier defenders, with Morrissey as a rising impact player as well. At forward the team is a lot more top heavy, with a lot less depth. 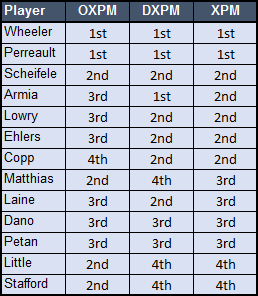 Wheeler and Perreault are exceptionally strong performers, and the Jets have something special in both Scheifele and Ehlers. However, the youth shows in the numbers, and not just in rookies needing time to separate themselves from the default starting XPM values. The team is young, but this means that many of them shall improve. While some will likely fall with age, like Enstrom and Byfuglien, there is a lot of positives on the roster for the future. Take a look at my list, for what it is worth. I will be very diplomatic. 1) I think it is bad taste to self promote your blog like this. Nothing to add to the above post other than a link to your blog? 2) Your blog is short on data.